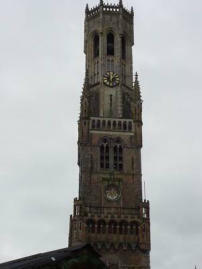 Bruges is in Belgium. It is a fine place for bears to go on holiday, though it is very hot in the summer and quite cold and wet in the winter. 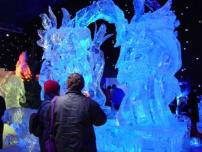 If you go at New Year you may be lucky enough to see the ice and snow sculpture exhibition. This sounds very silly, but actually it's quite spectacular and very cold. Be prepared for a long queue. We stayed at a comfortable hotel which looked out onto a canal where you could see swans swimming around and generally having a good time. 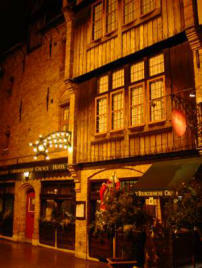 This picture shows the entrance to the hotel. Our room is in the middle level on the very left. Sightseers would come and take pictures of the view from just where we were. The hotel was not huge and didn't have a bar, and there was no minibar in the room, but it was very comfortable and very central. 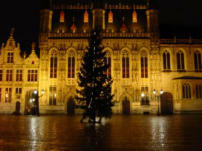 All hotels in Bruges are very nice and not expensive out of season. Everyone, of course, speaks perfect English. Currency is the Euro. There are lots of nice places for humans to eat. 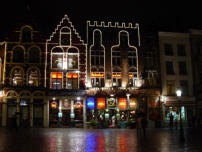 The bistros and restaurants on the main square are very expensive and are best avoided, but you don't have to go far to eat well. Look to see where the locals go. Avoid hot chocolate - too much cream is bad for you! Look for waffles and chips, but not together. 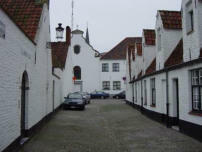 There are plenty of chocolate shops, the usual such as Leonidas and the more obscure such as van Oost. There are three good bears shops - one specialises in designer bears, but all are worth a visit. 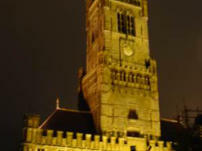 Bruges is a city for bears. Many shops have bears in their windows. Bears are welcome everywhere, but watch out for the local dogs!